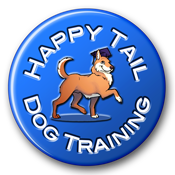 Below are lists of equipment I personally use with my own dogs and also recommend to clients. Use the quick links directly below to navigate to the section of this page you're interested in reading. Then click on the text in each of the bullets to access the specific content. Chilly Mat, this is a self-cooling gel mat (non-toxic) that cools without refrigeration, water, or electricity. Add this to your dog's crate to cool him off quickly. Omega Tricky Treat Ball, be sure to order the correct size for your dog. Another great puzzle toy that allows you to make it easy or harder depending on a dog's experience level with this particular toy. This Kong is marketed as being X-Rayable - meaning, if your dog happens to eat portions of it, this material will show up on X-Rays allowing vets the opportunity to locate the blockage if it happens to impact the dog's bowels. Calming Cap, helps greatly for car rides, vet visits, etc. Bow Wow Barrier - Retractable front and back door pet barrier that opens and closes with the door. This mesh barrier prevents pets from running outside as the door opens or jumping up on visitors at the door. Great solution for door-bolters in households where management is tough because family members aren't always compliant. Retract-A-Gate - retractable safety gate for pets that can be used indoors or outdoors. Calming Cap, helps greatly for car rides, vet visits, etc. It's also branded as a "Thundercap"